Your restaurant kitchen is the place where you prepare mouthwatering meals for your customers. But this delightful process has some unfortunate byproducts; moisture, odor and grease. So what do you do to get rid of these? Proper ventilation is the perfect solution. 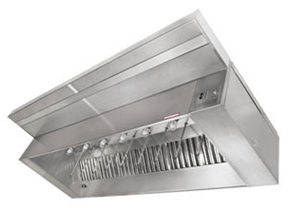 There are a number of exhaust hoods in the market; however, not all of them are suitable for your restaurant kitchen. You need to look into the technical aspects of the equipment to make the right decision. CaptiveAire is a leading commercial kitchen ventilation products manufacturer. The brand is known for its competitive pricing and fast, reliable lead times in the industry. In 2014, CaptiveAire was voted ‘Best in Class Overall’ under the ventilation systems category. CaptiveAire’s self-cleaning hood is stainless steel fabricated. It features a spay bar that extends to the full length of the hood. Inside the spray bar are nozzles that ensure appropriate spray down of the plenum and at the back of the filters. To clean the ductwork portion, a nozzle in the exhaust riser is located. This exhaust hood is manufactured with the hot water option with the help of which the hood plenum is automatically cleaned. The cleaning process takes place as scheduled by you or when the cooking operations are over. The company offers four different models under this category. The first is the premier low proximity hood which is used for over 450○ F and 600○F cooking surface temperatures. The second model, low proximity hood, is constructed with stainless steel enclosure panels. Designed in a save spacing manner, these exhaust hoods offer easy grease extraction. The third model is low proximity exhaust hood with plate shelf. They are used for over 600○F cooking surface temperatures and integrated with a plate shelf which eases the process of grease removal. The fourth model in this category is the low proximity Passover exhaust hood. They are usually used for over 400○F cooking surface temperatures, and with the top hood also used as the plate shelf, they offer superior exhaust rates. There are three different models in this category; however, only two are recommended for commercial use. Exhaust Only Hood is the first model. It is used for over 450○F, 600○F and 700○F cooking surface temperatures. This model is developed with superior exhaust rates, self-cleaning technology and efficient grease extraction process. The second model is low ceiling exhaust hoods which is used for over 400○F and 600○F cooking surface temperatures. These temperatures are the only major aspect that differentiates low ceiling exhaust hoods from exhaust only hoods. Get these CaptiveAire’s exhaust hoods at extremely affordable prices with us. In addition to these, we offer a wide variety of used restaurant kitchen equipment items from the leading brands in the industry.